Welcome back to Monday Motivation! The Splendid Sampler block 16 by Lindsay Mayland from American Patchwork and Quilting is what I worked on this weekend. I love the simplicity of this block and realized it opened itself up to one of my favorite things...FUSSY CUTTING! 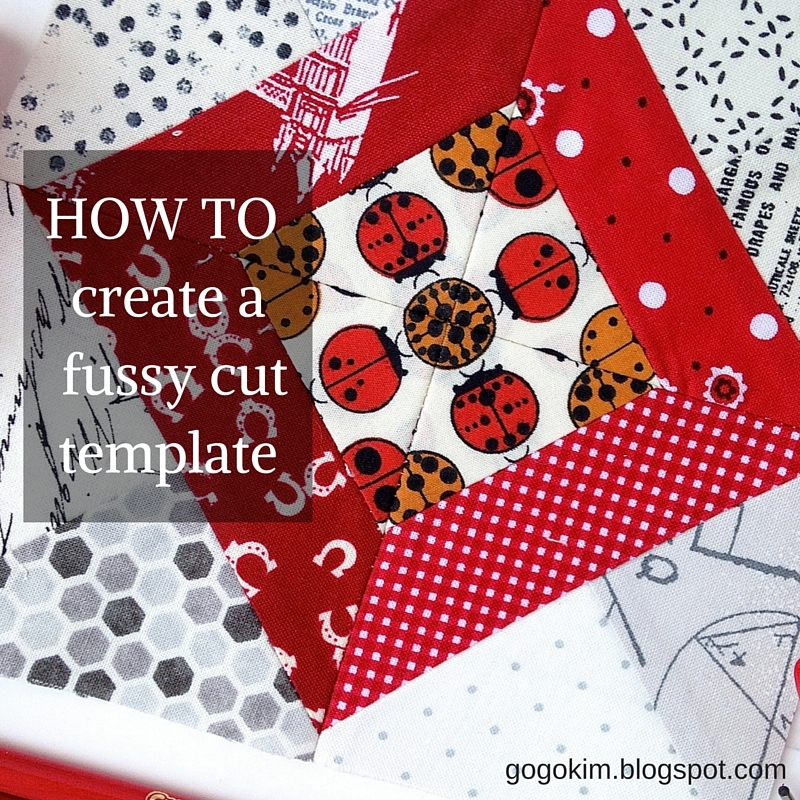 I am excited to share with you how easy it is to make a fussy cut template! 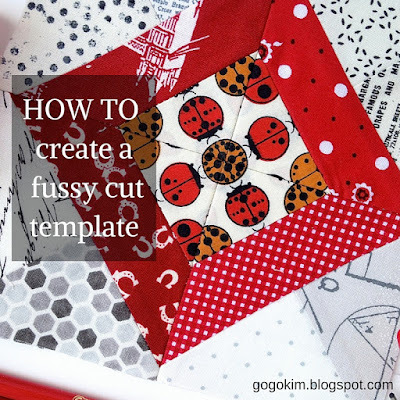 This week I am sharing how to fussy cut by making your template for the project you are working on without having to guess if it will look fantastic, saving both time and fabric ( and also your sanity). Fussy cuts are a fabulously fun way to take your sewing and make it more custom and in the case of this block, more personal. I have a thing for ladybugs! My daughter is named Katy and from the time she was born I have called her my ladybug. If you have ever met me you may have seen I even wear a ladybug necklace all the time. I love them! 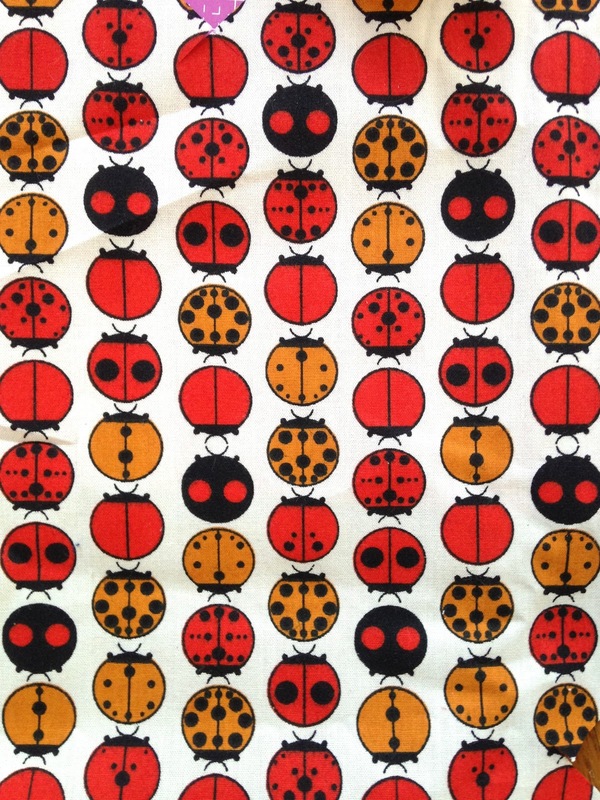 My friend Sara sent me the Charlie Harper ladybug fabric for Christmas a few years ago. The ladybugs are wonderful in this print and the perfect size for fussy cuts! The easiest way to make long lasting templates is to use Clear Template Plastic. The one I use is by Dritz. There are different variations of template but the one I am using for this project is the basic one #3119. It comes in a 12inx18in sheet and you can make a lot of templates with it! I purchased it from Joann's using a coupon and it is usually about $4 a sheet. For all of my piecing I use Aurifil 50wt thread. It is a strong 2 ply thread that helps maintain more accurate seams and flatter blocks! 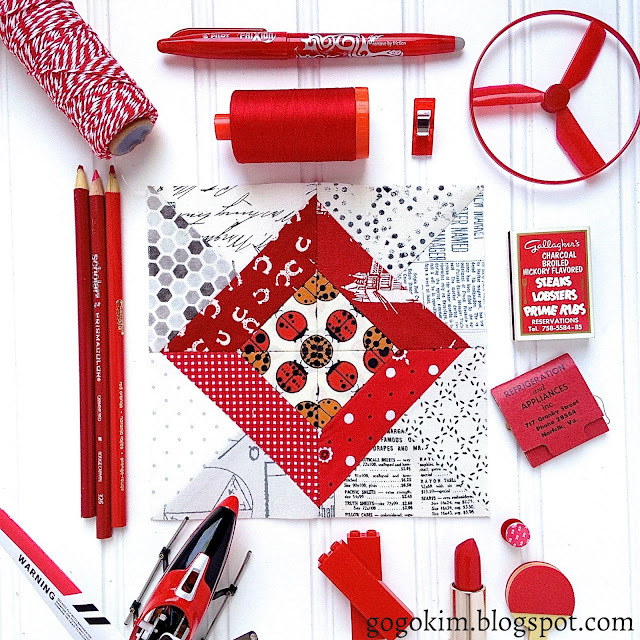 You can read more about the wonderful 50 wt thread by visiting the Aurifil website. Lets make a fussy cut template! The lady bug fussy cut is on the diagonal. 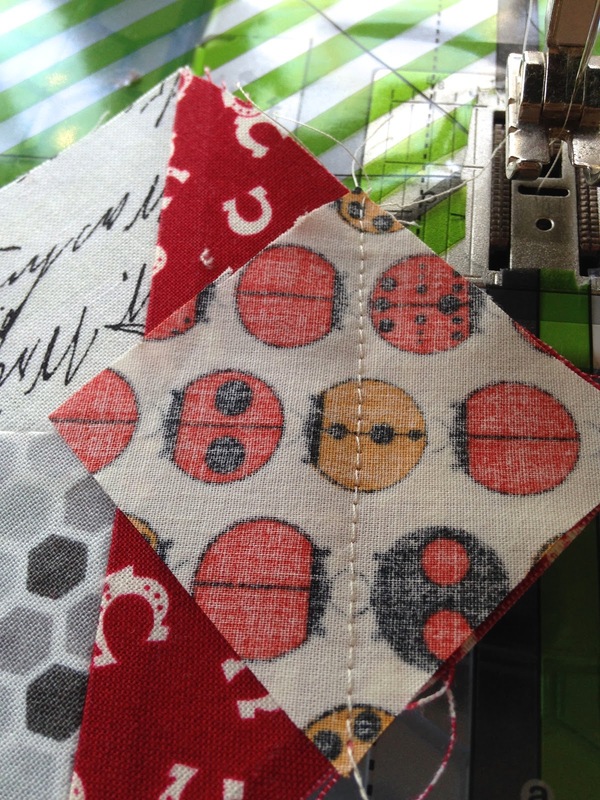 The pattern calls for the piece to start with a 1.5 inch square. 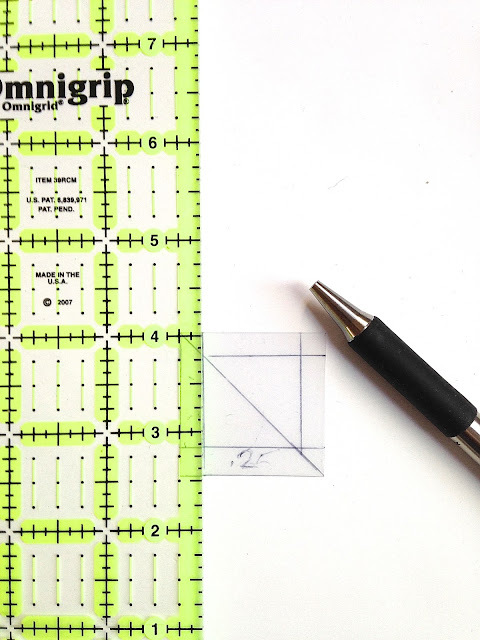 I use a simple ball point pen and my grid ruler for tracing. **I needed to slightly increase my template size to accommodate the full ladybug. 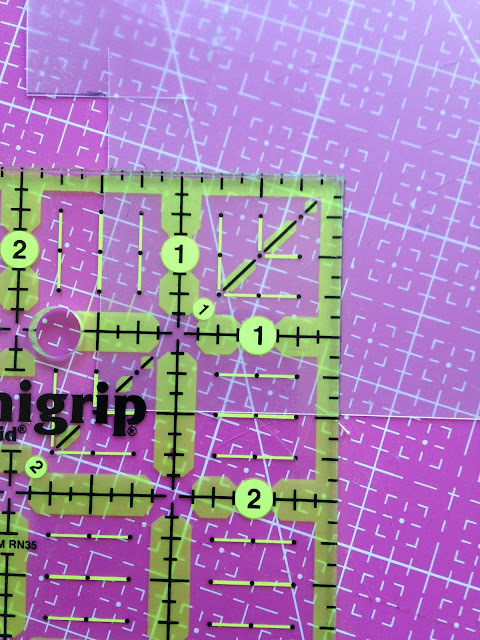 If you find that the fussy cut you need is larger than what this pattern calls for you can increase it ( this pattern lends itself to easy modification) by .5 in and it will make a slightly larger center without compromising the overall look. It works for this particular block but will not work for all blocks. Do not be afraid to try different things, you may be pleasantly surprised! If this was for a 1.5 in square, I would be done almost done ( always add in your 1/4 inch seam allowance) but this is going a little further with the angle. When making the template, make sure to add in the quarter inch seam allowance on all sides. If the template does not accommodate for these seams, you can end up cutting off an important part and be very unhappy. Using your grid ruler and pen again, draw these allowances in. My lines overlap but it is only me and I am not super fancy. You can see how the ladybug fits perfectly in the triangle. 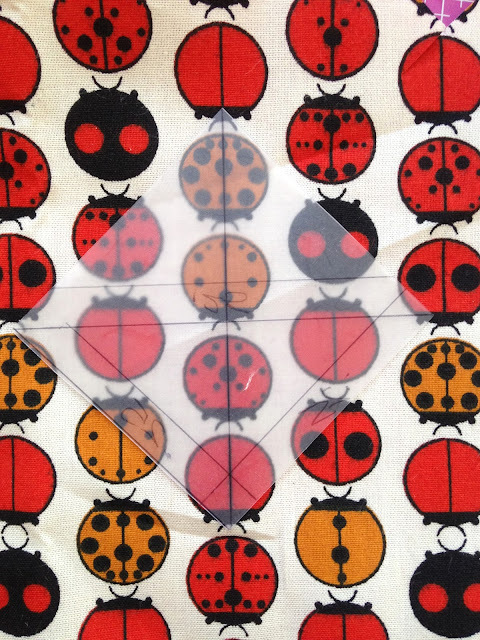 This fabric also had perfect lines in the centers of the bugs, so I added in that line as another guide to help me to create a better template. Another tip is when creating fussy cuts on the angle and pieces need to meet in the center, find repeats. The repeat was slightly off and I had originally wanted to use all different bugs but found that the centers would not create a nice visual. 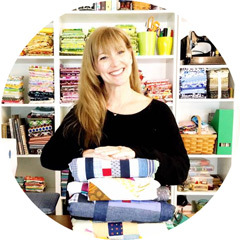 I spent many hours with Jack the seam ripper! To make sure that the ladybugs were going to line up, I also traced the location of the eyes, antennae and the part of the circular shape of the back of the ladybug that would be the focus. I used my favorite new tool Clearly Perfect Angles by New Leaf Stitches to not have to mark before sewing angles! With these being on an angle, starch was key to helping them keep their shape. Starch is your best friend! I hope you will try to add some fun fussy cutting into your blocks! I am always thrilled to see what people are making with my free tutorials! Please use the hashtag #gogokim on all social media outlets so I can see your beautiful projects! Thanks for the tutorial! Love your red inspiration board! I'm a green horn what is a"fussy cut"?